When you're a part of giving to Sam Houston State University, you're not just making SHSU a better place. You're essentially impacting the world by helping to ensure that the university continues to deliver an exceptional education-one that is student-centered and focused on extraordinary teaching. Gifts from alumni and friends help Sam Houston State continue to provide a quality education for our students and enables us to have a profound and meaningful effect on peoples’ lives – both today and in the future. Your gift publicly demonstrates your pride in Sam Houston State University and your investment in its future. All donors are recognized in the Annual Report to Donors Magazine. Gifts can be made in honor or in memory of a family member, friends, or professor who may have made a difference in your life. If a gift is made in honor of someone else, enclose a note with the person’s name and address. Upon receipt of a tribute gift, notification is sent to the honoree, or in the case of a memorial gift, the family of the deceased. Employers may participate in a matching gifts program, which can double or even triple your gift. 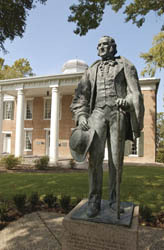 Gifts to Sam Houston State University are tax-deductible as allowed by law.